Arthritis is a painful degenerative condition with no apparent cure and as such, many people with severe arthritis are recommended to get joint replacement surgery. This surgery is extremely invasive and long-term consequences are an unknown. Some patients are left with permanent weakness, stiffness, and disability after their surgery. 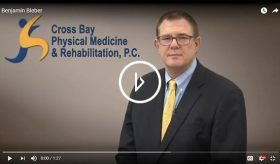 As a Sports Medicine and Rehabilitation physician with over 30 years of experience, I help patients with arthritis find pain relief and avoid joint replacement surgery.